Advertise on Crewspace, the private social network for professional road crew in the music industry (roadies) worldwide. Reach 17,000+ professional roadcrew (roadies) for the lowest rates around! Membership of crewspace is by invitation only, and is intended solely for pro crew. Members include many Tour Managers, Production Managers, Stage Managers, Audio engineers (FOH, IEM and monitor eningeers), Lighting designers and techs, Backline techs (guitar, bass, drum, keyboard etc. ), Merch personnel, drivers, security, caterers, wardrobe / hospitality people, and anyone who tours! Having your ad on crewspace costs only $15 per month in rotation in the Top Right box on every page, or $7 per month for a banner in rotation at the bottom of every page. 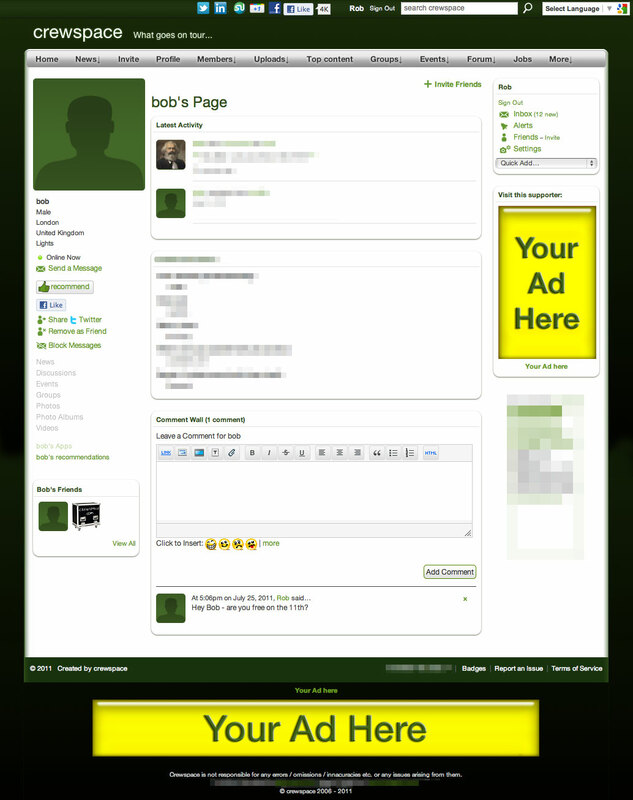 You can show your ad to everyone, or target it geographically (only show it to certain countries / regions / states etc.). Reduced rates might apply! Advertising is kept relevant and to a minimum on crewspace, and click through rates are often above web averages. Get free ad templates here! Are you a member of crewspace? Please type the two words in the box below. This is called a Recaptcha and it's to prove you're a human.